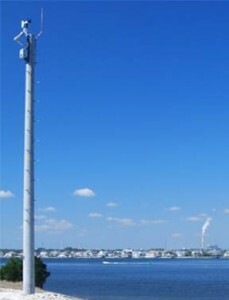 Micro-siting for the Hurricane Network has provided a unique set of challenges, requiring a balance between international standards and customer requirements. As with all of its stations, WeatherFlow’s initial objective has been to maximize compliance with World Meteorological Organization (WMO) standards as much as is practical, including station heights, fetch, and others. With that as a starting point, the Hurricane Network in particular needed to allow for required adjustments, the most important of which was to ensure that data would be collected throughout the duration of a landfalling hurricane. This included consideration of the potential for debris (airborne and waterborne), inundation, and wave action and necessitated a limited set of deviations from WMO standards (primarily in station height) in order to maximize station survivability. While certain deviations in station height were accepted, throughout the siting and installation process, primary emphasis was placed on maintaining a clear fetch in order to ensure the validity and freedom from obstructions for the wind data collected.